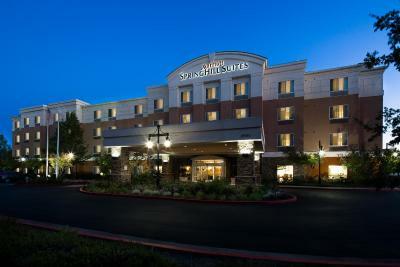 Lock in a great price for SpringHill Suites Sacramento Airport Natomas – rated 8.9 by recent guests! crystal at the front desk was cery accomadating she was vey helpful and professional. We reached bit early and staff tried their best to allowed me to check in bit early than 3 pm (usual check in time) Room and beds were clean. All the basics of a hotel room were covered: comfort, room size and cleanliness. the location was great with lots of places to eat in the area. The room was huge, nice living area, kitchenette, comfy bed, large tv selection. If the bathroom was more modern I'd give the room 10/10...as it is now I'd give it an 8/10. The suites were very clean and the location was convenient in terms of access to the airport. Bed was very comfy as were the pillows. All special requests for my room were provided if not doubled for what I needed. I see that as a good thing. Front desk staff were so friendly and professional..I was warmly greeted and questions regarding my comfort and my satisfaction for my requests felt genuine. Good job with customer service training. I'm particular about this because I train customer service employees for a living. I love that this hotel had a smart tv. I was able to log in to my Netflix account to steam my toddler's favorite shows. SpringHill Suites Sacramento Airport Natomas This rating is a reflection of how the property compares to the industry standard when it comes to price, facilities and services available. It's based on a self-evaluation by the property. Use this rating to help choose your stay! Featuring a free shuttle service from Natomas Airport, SpringHill Suites offers modern accommodations 4 miles from Sacramento city center. It features an indoor pool with a hot tub and an onsite fitness center. Complete with free WiFi, rooms at SpringHill Suites Sacramento Airport Natomas include a kitchenette with a wet bar ,a coffee machine, a microwave, and a refrigerator. A seating area with sofa and work desk is provided. Guests can enjoy a hot daily breakfast, served daily in the Great Room of the hotel. The on-site market provides refreshments and snacks 24/7. Popular nearby landmarks include California State Capitol, the Crocker Art Museum and the Tower Bridge, all within 10 minutes' drive from SpringHill Suites Sacramento hotel. When would you like to stay at SpringHill Suites Sacramento Airport Natomas? Offering free Wi-Fi and a flat-screen TV, this suite includes a counter with sink, microwave and a refrigerator. Newly renovated! King suites feature microwave, mini-fridge, and wet bar and include complimentary WiFi. SpringHill Suites is situated minutes from downtown Sacramento and 7 miles from the airport (SMF) and offers complimentary Wi-Fi, hot breakfast with fresh local choices, airport shuttle, indoor pool, whirlpool, and fitness center. House Rules SpringHill Suites Sacramento Airport Natomas takes special requests – add in the next step! SpringHill Suites Sacramento Airport Natomas accepts these cards and reserves the right to temporarily hold an amount prior to arrival. The water in the spa had a lot of chlorine or something in it, which made our eyes sting - bring goggles if you plan to go in. Room was spacious and had everything we needed. The breakfast was good. our room was skipped by housekeeping and i made to take off the do not disturb sign off so that they could freshen up the room no one did so and when i went to the front a gentlemen was there from the night at the front was not helpful. i jusy was upset at the fact that they lied about the do not disturb sign was on. While booking I had expected that rooms will be spacious but due to layout room was bit congusted. Second day breakfast menu was bit less menu. There was power failure during our stay. It took quite a long time to restore the power. No room service, the wake up call system was malfunctioning and the front desk receptionist on night duty was rude and not helpful. Nice place,very clean and comfortable. The Apple and orange juice was horrible!